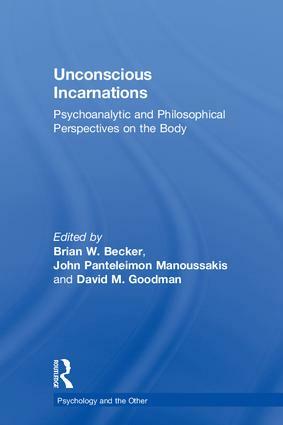 Unconscious Incarnations considers the status of the body in psychoanalytic theory and practice, bringing Freud and Lacan into conversation with continental philosophy to explore the heterogeneity of embodied life. By doing so, the body is no longer merely an object of scientific inquiry but also a lived body, a source of excessive intuition and affectivity, and a raw animality distinct from mere materiality. The contributors to this volume consist of philosophers, psychoanalytic scholars, and practitioners whose interdisciplinary explorations reformulate traditional psychoanalytic concepts such as trauma, healing, desire, subjectivity, and the unconscious. Collectively, they build toward the conclusion that phenomenologies of embodiment move psychoanalytic theory and practice away from representationalist models and toward an incarnational approach to psychic life. Under such a carnal horizon, trauma manifests as wounds and scars, therapy as touch, subjectivity as bodily boundedness, and the unconscious ‘real’ as an excessive remainder of flesh. Unconscious incarnations signal events where the unsignifiable appears among signifiers, the invisible within the visible, and absence within presence. In sum: where the flesh becomes word and the word retains its flesh. Unconscious Incarnations seeks to evoke this incarnational approach in order to break through tacit taboos toward the body in psychology and psychoanalysis. This interdisciplinary work will appeal greatly to psychoanalysts and psychoanalytic psychotherapists as well as philosophy scholars and clinical psychologists. "Unconscious Incarnations belongs among those books that push thought in new directions. The engagement of a series of questions and answers between phenomenology and psychoanalysis has rarely been so perfectly conducted. In this work, incorporation takes precedence over the standard phenomenological notion of incarnation. No longer content with this "flesh" as "lived body," this work addresses the "real body," or the "flesh" understood as an organic life that supports our passions and desires. Wounds and scars of the body, flesh and das Ding, body and desire, imaginary body and objectified body: In each of these themes we discover being born a new fecundity between psychoanalysis and phenomenology. This work, undoubtedly, will serve to break new ground. "-Emmanuel Falque, Honorary Dean, Catholic University of Paris. Brian W. Becker is Associate Professor of Neuropsychology at Lesley University. His research focuses on the intersections of phenomenology, religion, and psychoanalysis. John Panteleimon Manoussakis is Associate Professor of Philosophy at the College of the Holy Cross, and an Honorary Fellow at the Faculty of Theology and Philosophy of the Australian Catholic University. David M. Goodman is Associate Dean of Academic Affairs and Advising at the Woods College of Advancing Studies at Boston College and Associate Professor of Practice in the Philosophy department at Boston College’s Morrissey College of Arts and Sciences.